There are hundreds of findings, recommendations, and notes for all the potential problems and corrective measures that California termite inspectors need to know. I’m going to share some of the most common ones with you below. California termite report software programs will come pre-loaded with common findings and recommendations but these will need to be customized for each companies needs and preferences. There are 2 main styles of arranging your findings and recommendation for California termite reports. Although you are not forced to use either style by the Pest Control Act. You can make up your own if you want to be original but you if you do, it must comply with all the regulations for termite reports in the Structural Pest Control Act. The “Old School” style is the 1-10 system. At one point all California termite reports used the same 1-10 system. This is because the first page of the old 8.5 x 14 report specified 10 areas of a property and you were required to match your findings and recommendations with that list. With this system findings were categorized by the area of infestation. Example: Area 1 was the Substructure, so all the problems found in the Substructure would be listed in area 1. Each finding would have a letter starting with A. So if there were 3 findings in the Substructure they would be listed as 1A, 1B, and 1C in the report. When board changed the first page of the report to 8.5 x 11 and removed the 10 specified areas many saw this to be an opportunity to simplify termite report writing in California. 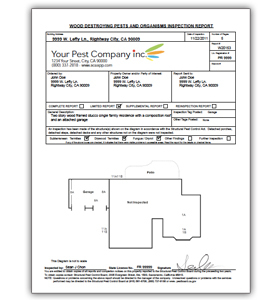 The Pest Control Operators of California association and it’s members came up with the 1-5 style of writing reports and encouraged it’s members and non-members to switch to the new format. The new format has been very successful and continues to grow in popularity among termite companies. The 1-5 style designates findings for each of the numbers. Example: 1 represents Subterranean Termites. So every finding that starts with a 1 would have something something to do with Subterranean Termites. If “Subs” for short, were found in 3 different areas, you could have 3 different findings and recommendations, 1A, 1B, and 1C. 1A might say that Subs were found in the garage and 1B may be for Subs found in the Substructure. Over the years, I’ve seen just about everything. Some companies completely ignore the 1-10 and 1-5 standards and just list each finding in alphabetical or numeric order and this is not a smart way to go. The reason we need standards is because termite report writing is difficult to learn and termite report reading can be just as difficult for the consumers. If a property owner get 2 or 3 estimates and every report is 9 pages long and every reports findings and recommendations are organized different it makes it really painful to try and compare them. Also, inspectors tend to move around from company to company so once they are trained to write reports in the 1-5 style, it is hard to get them re-trained to use another method. If your looking for good termite report software solution that comes ready to go, I recommend Bugbase. With Bugbase, a new company can sign up and have their first report out in about 30 minutes and look they have been in business for 20 years. Bugbase allows users to easily find pre-stored findings and recommendation and then quickly customize them for the specific report they are working on. The system then stores them in order automatically. You can easily edit anything for quick changes. Bugbase is set up to work with the 1-10 system and the 1-5 system of termite report writing.